Dishwashers Reviews: How to select the right one? Dishwashers are a big investment and you will want to get one that will last you years without exhibiting any problems. The good ones that will give you security and peace of mind are the slightly expensive ones. Planning to buy it may take months of saving up and tons of research. Because you don’t want to pay for hundreds of bucks for something that won’t live up to the expectation, you will want to do lots of reading about the products that fall under your needs and budget. It is absolutely necessary to read reviews written by fellow customers, so you will have an idea of the performance of the product. Anything that falls short to your expectations should be crossed out the list, not matter how promising it sounds to you. This is so you won’t have regrets in the future. There are tons of types and brands of dishwashers in the market; all you have to do is look for the one that suits your tastes. In this article, we will help you with the decision-making process by listing the factors that you should consider when getting a dishwasher. What are the factors that you should consider when getting a dishwasher? The factors listed below are unique to every consumer. It is up to them what is the best dishwasher they need based on their judgment. Needs: Determine the extent of use your dishwasher will get. If you have a relatively small family, then you don’t really need a big one. A small-sized one that you can put over a counter or built-in a cabinet may suffice for your needs. At the same time, it won’t take too much space. However, if you have a big family and often stage parties in your home, you may need a bigger one so you can wash all the dishes all at once. 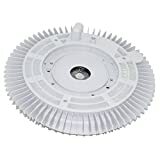 This will save you water, detergent, and electricity compared to washing a few pieces of dishes only and repeating it about five or so times. Also ask yourself if you need anything special when it comes to the washing cycles. If you have a baby or a toddler at home who really needs sanitized bottles and whatnot, a dishwasher can do it for you using a sanitize wash cycle. Other special features include glass or stemware, quick wash, pots scrub, etc. Features: As previously mentioned, you can choose several features that may come with your dishwasher. The more choices it has and the more complicated the wash cycles are means that the dishwasher is more expensive. If you really don’t need any of those special cycles mentioned, what you should look for in terms of dishwasher cycles are light, regular, pots and pans, and econo settings. It is good to have the econo settings because it air dries instead of heating the washed items. Heating is really a special option as you can just air-dry your plates, cookware, utensils, glasses, etc. 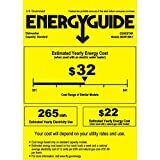 Using econo settings saves you a great deal in electricity because the heating element for drying uses a lot of power. Just take out the washed items and place them back onto a rack to let them dry on their own. 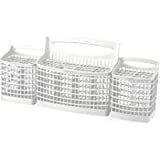 Regular dishwashers may have up to four different wash cycles while advanced models may have six or more. Don’t be swayed with the number of cycles; but the one that will be often used. Otherwise, it will just be a waste of money. Budget: You don’t want to invest a lot of money in something that you won’t use a lot. Therefore, determine the size and wash cycles of the dishwasher you need and do some canvassing online or in stores to find out the price range of the dishwasher with the specifications you need. Make a list of the brands and models of dishwashers that fall in your supposed budget. You can go lower a bit higher than your original budget, but try not to go over 50 percent more. If you have found the dishwasher that you really want, don’t buy it yet; wait for weekend or holiday sales. Almost all stores have this. Key Takeaway: Planning is important with every grand purchase. Don’t make it a habit to just jump into purchasing major home appliances because you want to get the best one that will last you years of service without encountering major problems. Instill in your mind all the factors listed above to help you decide the one best suited for your lifestyle. What are the types of dishwashers? Full-sized dishwasher – These are the ones suited for big families and those who always want to have parties at home. The smallest full-sized dishwasher can wash about a hundred pieces of pots, pans, plates, and cutlery. Big full-sized dishwashers have room for about 150 pieces. This is best for large dinner parties. Slimline dishwasher – This is like the slimmed version of the full-sized dishwasher. The average sized ones can fill up to a hundred items. 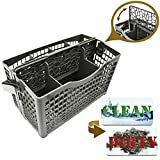 This is best for big families who want to be able to wash a lot of items at once while still keeping their kitchen compact. This is great for medium to small kitchens. Compact dishwasher – This is the smallest and most compact out of the three. It can be easily stored on a countertop or be hidden in a cabinet. 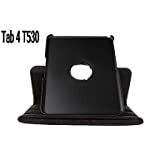 This is the best choice for small families who will use it sparingly on a daily basis. This type is also recommended for those with very little kitchen space. The capacity is about 50 items. Dishwashers are a staple in every kitchen. 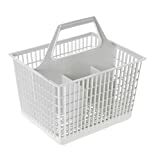 It will almost always be used on a daily basis, often more than once per day, so make sure to get one that will last years of service, that has enough capacity for all the items needed washing, and will save electricity in the long run. Built-in Dishwasher Reviews: How to buy the right one? Built-in dishwashers are a great addition to kitchens that sport compact appliances and cabinetry, where minimalism and organization are the main factors considered. When cabinetry or countertops are integrated together while appliances are inserted in between, it gives a more seamless and refined look. Many users opt for appliances that they can easily place in their counters for a neater overall look and for saving space as well. This way, they can have extra countertops used for prepping, instead of having a freestanding dishwasher that can take up space and not be use for other functions. Built-in dishwashers are also what most households in the US buy. 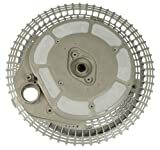 It is the common variety, and therefore you will find a lot of models, designs, and types available. Because many manufacturers create built-in dishwashers, you have an array to choose from. Here in this article, we will help you decide on the best built-in dishwasher for you. What are the factors to consider when getting a built-in dishwasher? Needs: It is imperative to know your needs before buying any appliances. It will determine the right size and the right model for you. If you have a big family and you are used to having three or more meals a day, you need more than the average-sized ones. However, if you are a small family and doesn’t use that much dishes, a small cabinet-like one will suffice. Also ask yourself if you are going to put big pans and pots in it because if yes, you might need a bigger one to cater to these dishes. There are a variety of sizes of dishwashers that can fit in a number of different cutleries, pots, pans, and plates. Size: There are three major sizes of dishwashers: Full-sized, slim line, or compact. The smallest full-sized dishwasher can fit 120 pots, pans, plates, and pieces of cutleries while the big ones have room for more than 150 items. Full-sized dishwashers are only good to use if you need something that can wash and clean after big dinner parties. For home or daily use, full-sized dishwasher are not recommended because if you only put very little pieces of plates and cutleries in it, you will waste water, heat and energy as the machine will heat up the entire dishwasher, full or empty. Slim line dishwashers are the small versions of full-sized ones. Slim line can hold about 80 to 100 items at once and is good for big families. However, like the full-sized version, this is still a bit big for home or daily use, which leads us to believe that the last size type, the compact dishwasher, is the best for home use for small families. Budget: Like in everything that involves buying new stuff, budget is a special requirement that you shouldn’t miss. Even if you have found the perfect type, size, and brand, you won’t be able to buy it if it is out of your budget. Before doing any major planning with your next buy, plan your budget first. Ask yourself how much you are willing to spend on a dishwasher that has the right size and a decent brand. After you have set your price limit, try checking online or in stores if there are items that match the budget you set. You can adjust your budget accordingly, depending on the dishwashers that you find. But remember not to go overboard. Functionality: Check the washing cycles that you want to be in your dishwasher. The most important ones that you should look for are light, regular, pots and pans, and econo settings. The last type enables your dishes to be air-dried instead of using the heating element, which saves energy costs, especially if you are not washing a lot, and there are no baby utensils that need to be heated. Other cycles, considered as “enhanced” include glass or stemware, quick wash, pots scrub, and sanitize wash are good features to have but they will cost you more. Having a three-tier water distribution system is also recommended as it provides good washing and better coverage. Key Takeaway: Before purchasing a dishwasher, ensure that it will satisfy all the factors listed above. Put your needs and budget above all, as it will determine the right type of dishwasher for you. This dishwasher features an easy built-in installation, four automatic cycles, and eight standard plate settings capacity. The interior is made of durable stainless steel material that greatly resists stains and corrosion, to ensure that your dishwasher will be in tip-top shape in years to come. This energy-star rated dishwasher has eight place setting capacity, six wash cycles, and washing phase indicator light to inform you of the current process in just one glance. It is very compact, neat, and easily installed. All you have to do is push it between two cabinets and you’re good to go. It has a helpful end of cycle buzzer to catch your attention quickly after it is done washing. 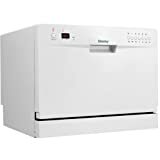 This dishwasher that comes in a sleek stainless steel finish is an 18-inch built-in machine that features energy saver dry options without the heat. It can be installed in a jiffy and works relatively quiet. Also works great for homes with limited space. Key Takeaway: It is best to check the specifications of each dishwasher thoroughly to ensure that it suits your needs. Each one of them has different features and requirements worth noting. Built-in dishwashers are nice to have to complete your kitchen, especially if you’re aiming to have a kitchen that has everything in it, but remain compact and accessible, especially if you have a relatively small space. Built-in dishwashers don’t take up too much space, especially if integrated with existing cabinetry. It is also very easy to install and move around. 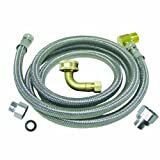 How to clean and repair your Dishwasher Drain Hose? When your dishwasher experiences difficulties and slowness in draining water, most likely, the drain hose is clogged. The clog may be found where the hose connects to the main house drain line or where it connects to the garbage disposal. Either way, you need to unclog it as soon as possible. You don’t really need the help of a plumber or be a seasoned handyman for you to unclog it. Unclogging the dishwasher drain hose isn’t really difficult and will only take a few moments. However, you need to find out the correct parts of the dishwasher for you to be able to locate whatever part is written in this guide. While it is not 100% sure that you’ll be able to entirely solve the problem, trying to fix the problem yourself is worth it before shelling some precious dollars on a dishwasher repairman. 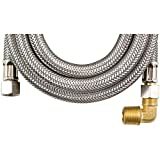 What is the step-by-step procedure of cleaning and repairing dishwasher drain hose? Step 1: Determine the type of dishwasher you have to know the right way of disassembling it. There are different ways of pulling apart the dishwasher and it depends on the structure of the dishwasher. Every manufacturer has their own way of structuring their products. You can find this in the manual that comes with it. Also, remember if the clog happened right after your installed the garbage disposal recently. If yes, the clog may be caused by not taking off the knockout plug. Simply remove it and the clog is gone. If not, go to the next step. Step 2: Find access to the hose. You might unscrew some covers for you to find its right location. Usually it is found behind a kickplate panel located at the bottom of the dishwasher and you can access it by removing the screws. Step 3: Remove the drain hose that connects the pump from the sink. Don’t forget to place something underneath the point of the hose that you’ll be taking off in case of spills. Use pliers to remove the wire clamp. Step 4: Shake the drain hose on top of the sink, garbage can, or palm to dislodge debris that may be stuck somewhere inside the hose. 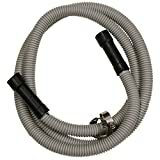 You can also run water into one end of the hose and out on the other end to wash away any remaining debris or dirt. It is recommended to use a garden hose or any faucet that lets water run with strong force. The pressure will help at dislodging the remaining obstacles. Step 5: If you fill the drain hose with strong water force and nothing or very little water passes through the other no matter how strong the water pressure or how hard you shake it, the obstruction may be irremovable. You can try poking it with a stick or something, but if you get up to that extent, it sounds like you have to replace the drain hose. 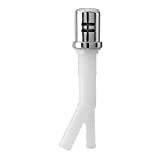 Step 6: If you have successfully removed the clog from the drain hose or you have bought a new one, it is time reconnect/connect the hose into the dishwasher. Place the wire clamps securely so that no water would leak out. Step 7: Run the dishwasher to check that everything is working and the dishwasher drain hose works in tip-top shape again. If you find that there’s still clogging yet the drain hose is working effectively, there may be other reasons why. Key Takeaway: Dirt and debris stuck in the drain hose are the major reasons why there is clogging. You can easily solve it by locating the drain hose, removing the debris, and putting it back to the dishwasher. If it can’t be solved, you can always purchase new dishwasher drain hose that won’t cost you over $20. Why is the dishwasher not draining properly? Obstructed Drain Valve – While checking the drain hose (see above), you can also check the drain valve, as it might be the one that is clogged, and not the hose. Obstructed Air Gap – If you have an air gap installed, check the tubes connected to it to see if there is any debris dislodged in it. Obstructed Filter – There might be big debris and dirt stuck in it. If so, go ahead and clean it to help alleviate the clog. Key Takeaway: If all of the above parts are working or you have replaced the ones thought to be faulty, the reason of the clog may be beyond cleaning or repairing. You may need to seek the help of a plumber or call the manufacturer of the company to help you with troubleshooting. After all, they know their product better than you do. 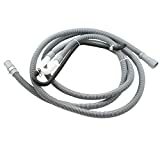 The dishwasher drain hose is one of the most important parts of the appliance as it is the route of the dirty water after it has done cleaning and washing your plates, pots, pans, and utensils. Sometimes, debris, grime, and dirt may cause a build-up in the drain hose, causing major clogs in the area, especially if grease has stuck into the walls of the drain hose. Because the dishwasher drain hose can be easily accessed, you can clean and repair the dishwasher drain hose yourself or replace it when necessary.